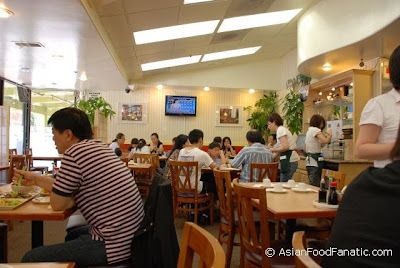 Celebrating Asian Food in the San Francisco Bay Area! My wife is not easily impressed with restaurants. It takes an exceptional one to gain her accolades. So when she enthusiastically endorses a restaurant as having authentic Taiwanese taste (she herself hails from Taiwan), I have to respect the place for measuring up to her exacting standards. 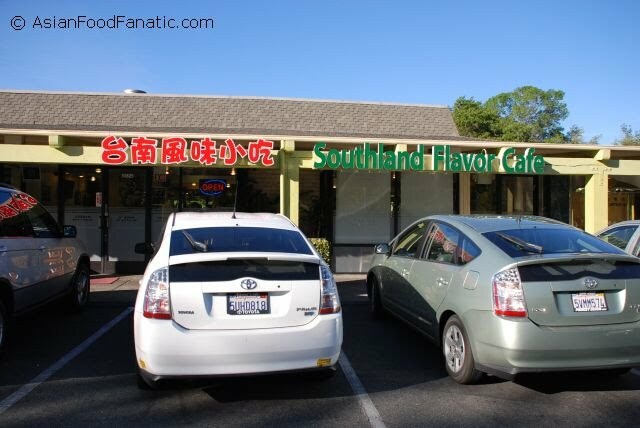 One of these rare places is the Southland Flavor Cafe in Cupertino, CA. We sauntered in one afternoon and found business to be brisk as always. 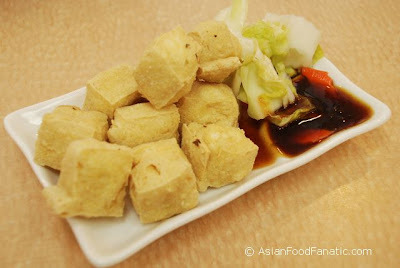 We started off with a Taiwanese favorite: stinky tofu. My wife first introduced me to this pungent dish years ago while we were still dating. And although we have (well, mostly she has) eaten it many times since then, I still don't understand the appeal of this unusual dish. Despite its "aroma", stinky tofu is one of the most popular snacks in Taiwan. So what does it taste like? It doesn't taste bad, actually. But I don't find anything really special about it, either. To me, once one gets past the smell, it doesn't really offer anything different than regular tofu. However, my wife disagrees and gives Southland Flavor Cafe's stinky tofu two thumbs up. Well, all I can say is bon appetit my love, knock yourself out. Fortunately, the other dishes we ordered justified my wife's praise for this place. Like the pork potage soup, which featured generous chunks of tender pork immersed in a refreshing broth, spiced up with a tinge of satay sauce. 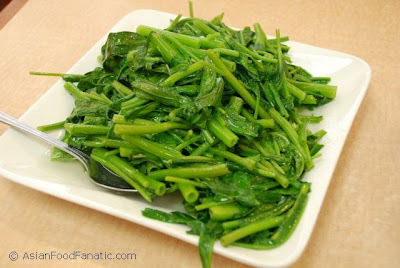 We had a plateful of on choy - fresh and crunchy. The sauteed beef special was also quite good. 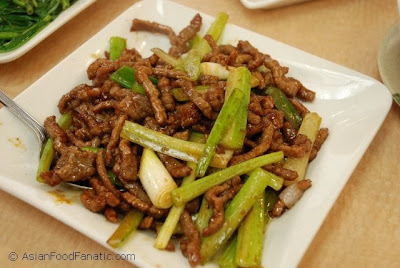 It's these other dishes that explain to me why this place is one of my wife's favorites. It has also become one of mine, and I look forward to our next visit there. I just won't be going there to eat stinky tofu. I'll leave that to my wife. I am a Filipino of Chinese ancestry, living and working in Silicon Valley. I love Asian food and I feel really fortunate to live in this area of diverse cultures and culinary offerings. 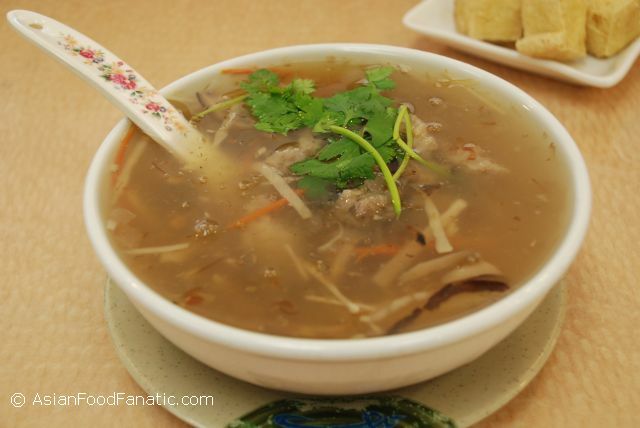 The Bay Area is truly an Asian food lover's paradise. One can find just about any type of Asian restaurant one fancies: Thai, Indian, Vietnamese, Chinese...you name it! I am especially thrilled that my home town of Milpitas, CA, with its large Filipino population, offers plenty of places to enjoy Filipino cooking. However, that's not to say that I focus solely on Filipino food. I enjoy exploring all the various cuisines of Asia. My strategy for finding good Asian restaurants: talk to people of the nationality whose cuisine I want to experience and ask for recommendations. For instance, when I talk to a Thai person, I will invariably ask "Do you know any good Thai restaurants?" This blog chronicles my explorations. Enjoy!